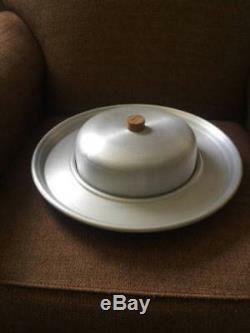 This listing is for a vintage 1930's Art Deco pre- Eames Mid Century Modern Era style original Russel Wright Spun Aluminum Serving Tray with Dome Lid, about 5" high and about 16" wide. 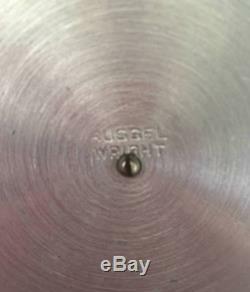 The base is stamped with Mr.
Wright's logo name on it. A great piece to add to your collection and I have many other Russel Wright Spun Aluminum pieces for sale in my other listings so check them all out!!! The condition is good/functional and th. Ere is not really much typical wear from use although this piece actually doesn't look like it was used because I couldn't really find any dings dents or deep scratches like are normally found on the aluminum pieces. I tried to illustrate the condition in the photos so. 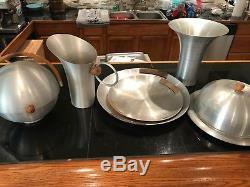 PLEASE LOOK carefully at all the photos because theyre the biggest part of this description and also please note the last picture of all of the Spun Aluminum pieces next to each other on the bartop are showing you many of the pieces I have listed but note this listing is for the Spun Aluminum Serving Tray with Dome Lid ONLY. If that's the case I will let you know. Thank you and I look forward to accepting your best offer!!! 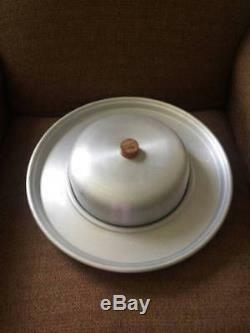 The item "RUSSEL WRIGHT SPUN ALUMINUM possibly teak Wood Serving Tray with Dome Domed Lid" is in sale since Friday, October 5, 2018. 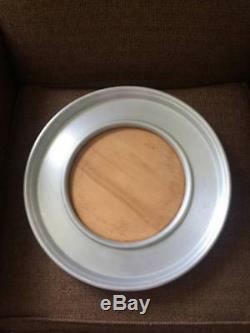 This item is in the category "Pottery & Glass\Pottery & China\China & Dinnerware\Russel Wright". 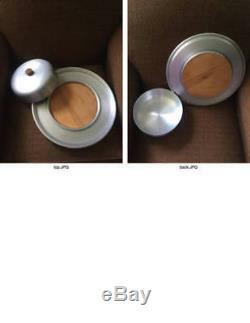 The seller is "coolstuffcollector1" and is located in Saint Louis, Missouri. This item can be shipped to United States, Canada, United Kingdom, Denmark, Romania, Slovakia, Bulgaria, Czech republic, Finland, Hungary, Latvia, Lithuania, Malta, Estonia, Australia, Greece, Portugal, Cyprus, Slovenia, Japan, China, Sweden, South Korea, Indonesia, Taiwan, South africa, Thailand, Belgium, France, Hong Kong, Ireland, Netherlands, Poland, Spain, Italy, Germany, Austria, Israel, Mexico, New Zealand, Philippines, Singapore, Switzerland, Norway, Saudi arabia, Ukraine, United arab emirates, Qatar, Kuwait, Bahrain, Croatia, Malaysia, Brazil, Chile, Colombia, Costa rica, Dominican republic, Panama, Trinidad and tobago, Guatemala, El salvador, Honduras, Jamaica.